WASHINGTON — Iraqi violence has spiked in recent months. 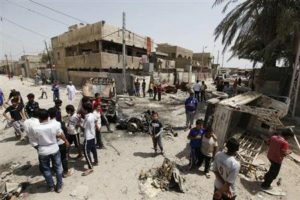 Reuters reports that the United Nations (U.N.) is worried that the violence will rival 2006-2007’s sectarian “slaughter“. Over 1,000 people were killed last month in May in violence between Sunni and Shi’a Muslims throughout the country. Additionally, over the past two months about 2,000 people were killed. This is fueling fears and concerns that the country will evolve into a brutal civil war, if it has not reached that point already. Car and suicide bombings have rocked the country the past several months, which has led to another outpouring of violence. Their simultaneous nature indicates that al-Qaeda is to blame, which is worrisome for the Iraqi government. What are the primary reasons for the violence? Sunni and Shi’a Muslims are fighting for turf as Iraqi politics have reached a stalemate. It also does not help that the Syrian civil war was started by Sunnis and that current doldrums in Iraq have upset Iraqi Sunnis. The Iraqi government is run by the Shi’a majority, leaving the minority Sunnis almost powerless. The Sunnis were favorably treated under Saddam Hussein, who was sympathetic to the Sunnis. Current Iraqi Prime Minister, and Shi’a Muslim, Nuri al-Maliki, has survived numerous protests and demonstrations by Sunnis calling for his resignation. He met with religious leaders of both Sunni and Shi’a Muslisms to try to calm the escalating violence. However, these talks availed nothing as to completely addressing Sunnis discontent. Now, with the U.S. gone, Sunnis and al-Qaeda-affiliated fighters are taking back cities and towns that were cleared of Islamist insurgents. This does not bode well for the Shi’a Muslims in Iraq. Some allege that Iran is interfering in Iraq, even after Iranian president Mahmoud Ahmadinejad called for peace in Iraq.